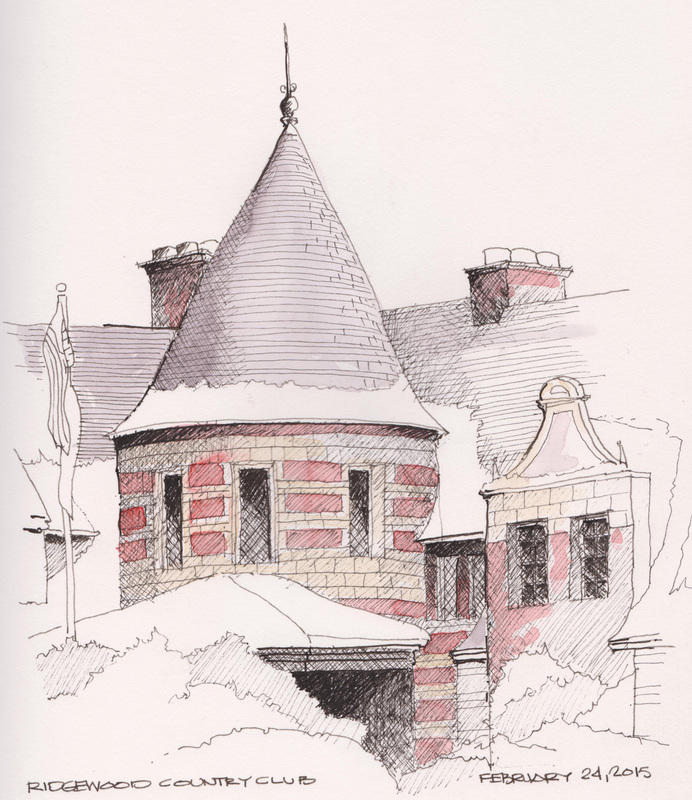 A quick sketch of the entry turret while waiting for my next meeting at the club. The Ridgewood Country Club is a twenty-seven-hole golf course and clubhouse constructed in Paramus, New Jersey and opened on May 30th, 1929. Ridgewood is also a PGA Tour stop every 3 years as part ot the Barclay’s Tournament. The Norman Revival clubhouse was designed by Clifford Wendehack. , who was among the foremost clubhouse architects of the early twentieth century. Lamy Safari Fountain pen with Noodlers Black ink, Daniel Smith watercolors and Stillman and Birn Alpha Series sketchbook. Great sketch of a beautiful CC.